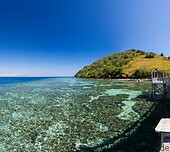 Sabolan (or Sebolon) is a small island located about 15 km to the north of Labuan Bajo. 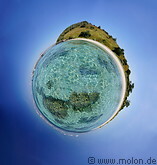 The egg-shaped island has a nice long beach along its southern coast, but is otherwise uninhabited. There are no rourist facilities whatsoever on Sabolan, but the island is accessible for tourists with day trips from Labuan Bajo. The southern beach has crystal clear seawater and offers very little shadow (no big trees or coconut palms on the island).